UK cinema box office takings passed the £1bn mark for the first time last year, according to the British Film Institute (BFI). Figures show earnings increased by 5% to £1.04bn, helped by the success of films including The King's Speech and The Inbetweeners. 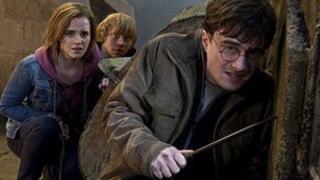 The highest grossing movie of the year was Harry Potter and the Deathly Hallows - Part 2 taking £73m. Total admissions were also up 1.4% from 2010 with 171.6m tickets sold. The figures also show that independent British film recorded its best year in terms of market share with 13.5%. Market share for all British films at the UK box office, including independents and those shot in the UK but financed from abroad, reached 36.2%, up from 24.0% in 2010. Eight of the top 20 grossing films of the year were made in the UK. The BFI said the strong performance was driven by the popularity of both British independent films like The Inbetweeners and blockbusters made in the UK with British talent, crew and services, such as the Potter series and Sherlock Holmes: A Game of Shadows. Total investment in UK-based film production reached a record £1.26bn in 2011, a small rise from £1.25bn the year before. However there was a considerable drop in the total number of UK films produced, with only 169 made - down from 262 in 2010. The expenditure on making domestic feature films also fell from £214m in 2010 to £194m in 2011, representing a 9.4% drop. But conversely, the number of UK co-productions with other countries increased from 30 to 40. "It's still a challenging time for filmmakers trying to raise finance to make independent British films in this tough economic climate," said the BFI's Amanda Nevill. "As we enter 2012, many challenges remain but today's figures clearly show that keeping audiences at the heart of everything we do will help the British film industry to enjoy even greater success in the future and continue to be an important contributor to the UK economy." The Industry Trust - the body for copyright awareness and protection in the film industry - said it was encouraged by the figures. "It's great to see film fans' enthusiasm for the fantastic creative output of the British film industry," said director general Liz Bales. "The BFI figures provide further evidence that the overwhelming majority of people are willing to pay for film, TV and video content." The figures account for UK cinemas, excluding the Republic of Ireland.